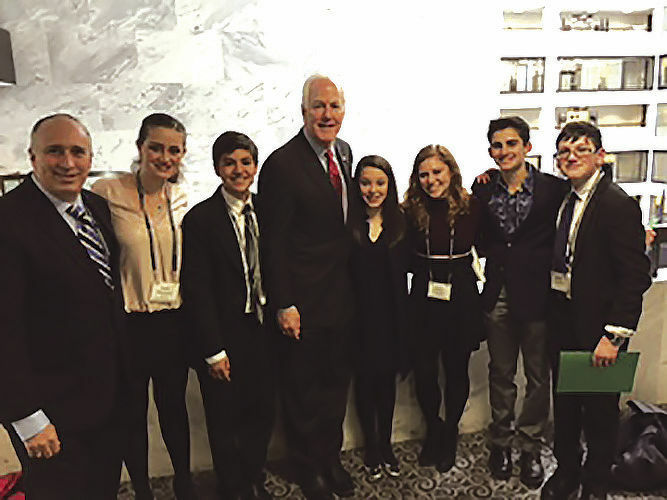 Rabbi Claudio Kogan, far left, is seen with students from Temple Emanuel, of McAllen, meeting with U.S. Sen. John Cornyn, R-Texas, center, in Washington, D.C.
One of the ongoing phenomena that our Rio Grande Valley has experienced in the past several years is the migration of immigrants from Central America into the United States — often through our region. We have witnessed thousands of men, women and children crossing our borders searching for a better future. And their quest to improve their lives has drawn national, even international consternation. The immigration debate that this movement has spurred reminded me of why I decided to move to the Rio Grande Valley five years ago, and to serve as the rabbi of Temple Emanuel, a vibrant Jewish congregation located in McAllen. Simply, I saw a compassion for humanity based on this congregation’s own humanity. In making a decision to come to McAllen, I learned that Temple Emanuel was the spiritual home to a diverse and multi-generational community, that its members were from different places in the United States and South America, and most importantly, that Temple Emanuel’s founding fathers and mothers came to the Rio Grande Valley in the early 1930’s for a better future — much like the scores of migrants that followed — and to build a home whose foundation was the Jewish faith. Many of these pioneers were in the produce business. Some were retail merchants and some professionals. What I have learned since my arrival is the impact the Jewish community has had on our community. It is no lesser and no greater than our Christian and Muslim brothers and sisters have had, but it based in the same type of deep and abiding faith in God and in our neighbors. I am proud that our congregation has demonstrated this faith outside of the Valley to both the nation and the world. In the last 26 years, for example, five members of our congregation received the “Easter Seals Humanitarian of The Year” award. In the last five years, 12 of Temple Emanuel’s high school students have traveled to Washington D.C., to learn and to lobby members of Congress. They urged our elected officials to work for immigration reform, to take care of the needy, to pay more attention to healthcare reforms and to prevent bullying in school. Temple Emanuel and its members have worked hard to advance a healthy interfaith dialogue. With the Catholic Church, we have created “Hermanos,” a dialogue between Judaism and Catholicism. Our children have talked and played and learned from children of other faiths. We have hosted interfaith meetings and the Thanksgiving Interfaith service, and invited the Imam from the local Muslim congregation to be part of this relationship. The Bishop, the Imam and I have had several encounters since then, and are in continuous conversation that deepens our friendship. And in a recognition of this effort, last month I was honored to attend the second interfaith international meeting at the Domus Galilee, in Israel — the only reform rabbi from Texas to attend. At that conference, cardinals, bishops and rabbis from all over the world gathered to talk about peace and how to work together better. Inspired by the words of Pope Francis, we talked about how to reduce hunger, how to strengthen our faith, how to bring health care for those in need, how to be more sensible to immigrants and how to build bridges instead of walls. We remembered that in the Hebrew Bible, God teaches us 36 times that when strangers sojourn with you in your land you shall not do them wrong. The strangers who sojourn shall be to you as the natives among you, and you shall love them as yourself, for you were strangers in the land of Egypt. The trip to Galilee was an experience that created hope in me for a better world and a better McAllen — as long as we act on the principles of faith demonstrated by Pope Francis. 70th anniversary, which is, coincidentally, the 70th anniversary of the founding of the State of Israel. As we celebrate these two historical events, we can proudly say that the Jewish community remains a fundamental pillar in the Valley, steeped in faith and in the belief of our neighbors. We will always maintain our connection with the core of this community, including migrant farmworkers, those in business, educators, the faith community — and the immigrants who have made this region so strong.